The Thirteenth Judicial District Commission on Judicial Performance voted 7-3 that Judge Sara M. Wagers-Johnson BE RETAINED on condition that she engage in a performance improvement plan. Judge Wagers-Johnson received a Bachelor of Arts degree from the University of Colorado in Sociology in 1997 and a Juris Doctor degree from the University of Denver in 2001, where she graduated in the top 10 percent of her class. She currently provides some pro bono services in her community, is a Clover Bud leader in 4-H and volunteers for the Wray Rehabilitation and Activities Center. She also serves as municipal court judge for Wray, Yuma and Eckley, and as prosecuting attorney for the municipal court in Akron. Evaluation method used by the commission included reviews of the current and 2013 interim judicial performance survey reports. Those reports contained summaries of responses to survey questions and comments from attorneys and non-attorneys who had been involved in proceedings in Judge Wagers-Johnson’s courtroom. The non-attorneys surveyed included civil litigants, criminal defendants, jurors, witnesses, crime victims, court staff and interpreters, probation and law enforcement officers. The evaluation process also involved review of the Judge’s written self evaluation, review of a sample of the Judge’s written and transcribed oral decisions, courtroom observations by some members of the commission and an interview with the Judge. Of all attorneys surveyed about retention, 50% recommended retaining Judge Wagers-Johnson, 35% recommended not to retain, and 15% made no recommendation. Of non-attorneys surveyed, 61% recommended retaining Judge Wagers-Johnson, 18% not to retain, and 21% made no recommendation. Survey responses indicated scores below the statewide average for other county judges up for retention in several areas. The greatest issues of concern regarding Judge Wagers-Johnson were in the area of courtroom demeanor, communications and diligence. Both survey comments and courtroom observations confirmed the survey scores, leading to the commission’s recommendation for a performance improvement plan. 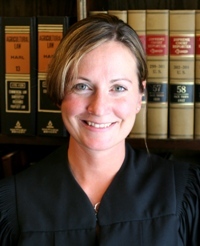 Judge Wagers-Johnson has consulted with an experienced judge to improve her courtroom skills. The survey results indicate that Judge Wagers-Johnson performed well in overall case management.